If you are looking for a plant that lives up to its common name the Chain of hearts plant or Ceropegia woodii is certainly it. Mainly grown as an indoor plant, and mostly in a hanging basket. 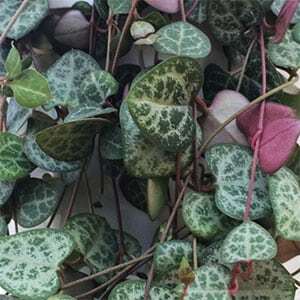 The foliage is a spotted mid green and grey it hangs down in strings of heart shaped leaves in a cascading manner. The Chain of hearts plant will also flower, small pink or magenta to mauve waxy flowers from spring through to autumn are an added interest to the foliage. The long chains can reach 3 – 4 meters in length, a fully grown Chain of hearts plant is an impressive site in a hanging basket. The correct botanical name is Ceropegia linearis ssp. woodii. Its from South Africa, and is the most commonly grown plant in the genus. One of the great things about the Chain of hearts plant is its easy care nature.It is a succulent and will grow indoors or outdoors. It likes good filtered light and has a fairly low water requirement. A free draining potting mix is best, mix in a little perlite or similar material to a normal potting mix to improve drainage. The plant forms tubers and does so in large numbers, these store water and nutrients which allow the plant to survive for long periods without much care. Allow plants to drain well and the soil to dry a little between watering. Cut back on water during winter. A little slow release fertiliser in spring is usually adequate. Propagation is easy from cuttings, best taken in spring. Cuttings are a better way to propagate the plant than by trying to divide the tubers, division of the tubers often causes fungal problems and the plant can die. 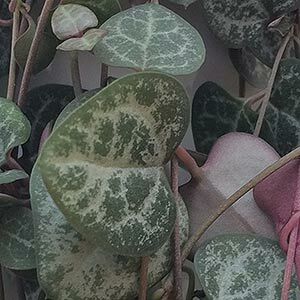 Foliage – Heart shaped, green and silver. The amount of exposure to light will determine foliage colour to some extent. Drought tolerant – No, although this is a very hardy plant and will cope with short dry periods. Container growing – Yes, the Chain of hearts plant is well suited to hanging baskets and other containers. Ceropegia ampliata – Also known as the ‘Bushmans Pipe’, interesting tubular white flowers. Ceropegia distincta ssp. haygarthii – The most fascinating flowers of all, worth looking at Google images. Ceropegia sandersonii – Strange green and white ‘Umbrella shaped Flowers’. Ceropegia stapeliiformis – Also known as the ’Snake Plant’.